While mouths are watering over the iPhone 4, where are all of the old flip phones? I must admit that inescapable clumsiness has left me with more than a few phone mishaps and a drawer full of old cell phones. Even worse, many more phones are laying at the bottom of a landfill contributing to the mess that the government has deemed e-waste. It is hard to believe that only ten years ago we were relying on phones such as the Nokia 5110 for our mobile communication. Quickly advancing technology and our modern addiction to it comes with some negative side effects. Producing and processing the raw materials for one cell phone creates over three tons of mining waste. With the quick turnover of cell phones, old devices are constantly being tossed aside or in the trash. The NRDC estimates that in the U.S. alone 100 million cell phones get thrown away each year. When disposed of improperly, cell phones, along with other electronics, release toxic arsenic, mercury and cadmium into the environment. E-waste has become a mounting global problem. The United States produces over three million tons of e-waste each year and China is not far behind. The most controversy stems from the exportation of its disposal. Despite regulations, e-waste is often exported by developed countries to developing ones. Green businesses are emerging out of the e-waste. Companies such as ecoATM are providing creative solutions to the e-waste problem. The San Diego-based company works to maximize reuse of electronic devices through the use of automated self-serve kiosks. The system uses advanced machine vision and electronic diagnostics to evaluate and buy back used electronics directly from consumers for cash or store credit. The machine visually identifies and assesses a phone’s condition in seconds. After the electronics are reclaimed, they are either reused or recycled. The company notes that many cell phones are retired when they have over three quarters of their life left. The devices selected for reuse are sent to refurbishment companies that sell them back to consumers. 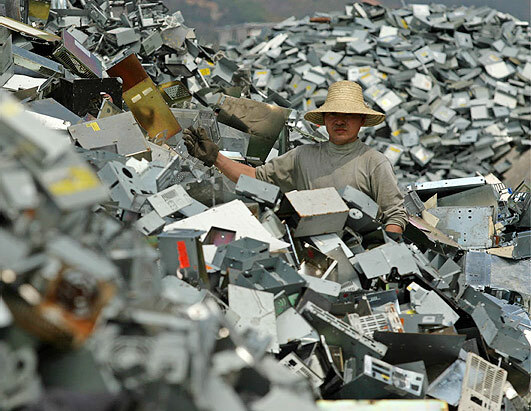 When devices are past usability, they are mined to extract precious metals and spare parts. 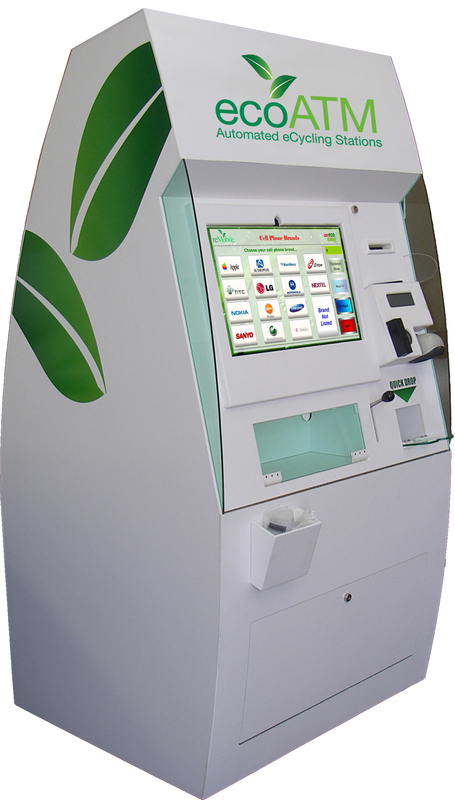 Users of the ecoATM can be green and make significant cash. Not a bad deal, is it? The average visitor to the ecoATM recieved $10-15 for their old device. Some are paid as much as $75 for their used phone depending on its age, condition and demand in the secondary market. The company also offers free corporate services to handle old company phones, pagers and other portable electronic devices. Currently, ecoATM is only located in parts of California, Kansas and Nebraska. With recent investment in the company, ecoATM hopes to expand nationally by late 2011. Meanwhile, we must be aware of the consequences of the modern technology addiction. Is there an app for that? Wow! I did not realize that cell phones create so much waste! I have saved many of my phones, but admit I have ruined about one every other year since I was…. 18? Do you know of any resources or opinions on buying phones secondhand? With the rate of people (including me) wanting a Verizon Iphone over an AT&T version, I can see the waste rate increasing. This is a great post!! I hope we get something like it in our area soon! I have 2 old cell phones and an old laptop just sitting in my room. I thought about selling the parts, but I never got around to it. I think I want to recycle them instead. There are programs that collect cell phones to send to soldiers so that they can talk to their families, but I’m just not sure the collecting companies really send them. What a brilliant idea for ecoATM – I’d never heard of that. I believe making it easy to recycle is the key to increasing it and encouraging more people to do it. THanks for an informative post!